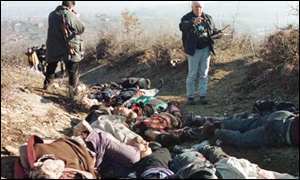 The beginning of the end of Western social peace: Serbian terrorists and their Bosnian victims, 1992. Paid by Moscow. Paul Manafort has been unmasked as an active asset of the Kremlin’s borderless outreach, in his sleazy advocacy for the Russian enemies of Ukrainian independence. But Ukraine looms yet larger in the history of the Putin plot against America. 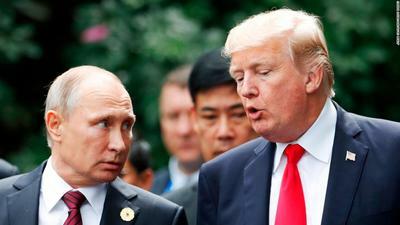 The ferocious hatred of “Blue Putin” (Goluboy, the color of half the Ukrainian flag and of the warm-water resources Russia craves), for Hillary Rodham Clinton, reflects the Russian martial arts instructor’s rage at U.S. leaders who denounced the Russian seizure of Crimea. Earlier this year, Radio Free Europe reported on a Ukrainian investigation of 54 pro-Russian fascist fighters involved in attacks on Ukrainian forces in Donetsk and Lugansk beginning in July 2014. The 54 illegal combatants were allegedly members of a “foreign legion” called the “Continental Brigade,” according to RFE. The Ukrainian Prosecutor’s Office lists six Serbs among the group – which also comprises 21 Spanish and 10 Italian nationals. Radomir Počuča, a former Serbian special police spokesperson, posted regular videos, photos and other entries related to his involvement in aggression against Donetsk. Počuča was arrested in Serbia and given an 18-month conditional jail sentence in 2016. The roster includes a self-proclaimed commander of Serbian Chetnik paramilitaries, Bratislav Živković, expelled from Romania in 2017. 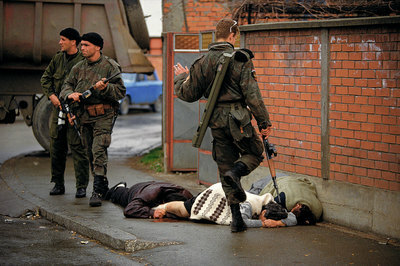 What Chetniks do: Racak, Kosova, 1999. But the Russian campaign against Ukraine has even more precedent for the present moment, and more current impact, than most would expect. In ex-Yugoslavia and Russia alike, the world witnessed, without comprehending or even taking note of it, former liberal dissidents, perceived as bearers of modernity, rushing away from democracy into fascism once the old “Marxist” order collapsed. The nucleus of neofascism in Serbia was made up of former “humanist Marxists” affiliated with the “Praxis” group of philosophers, as detailed in a path-breaking investigation by American journalist Laura Secor. For his part, Radovan Karadžić, the peerless advocate of genocide against Bosnian Muslims, launched an adventure as leader of a Bosnian “green party” before being hired to incite mass murder. 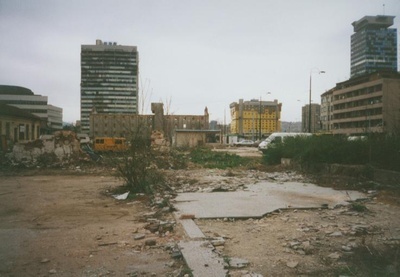 Karadžić’s political career: total destruction of Bosnian government facilities in Sarajevo. An alumnus of Columbia University. Protected by Putin. Indeed, Karadžić, along with the “prophet” of brutalization, Vojislav Šešelj, and a racist propagandist, Gojko Djogo, benefited from the patronage of “bien-pensant” Western human rights activists prior to the eruption of “Mad Max World” in the Balkans. The famous Bosnian traitor-in-chief Emir Kusturica, a film director who renamed himself “Nemanja” to de-Islamize himself, enjoys the patronage of Hollywood superstar Johnny Depp. Šešelj’s political career — still criminal. Former faculty member at the University of Michigan. Employed by the Kremlin. From the Russian side, one of the most characteristic figures in this horrifying panoply is Eduard Limonov. A scribbler of novels, Limonov wandered through the halls of literary exile and success in the West before launching a “national Bolshevik” Nazi party in Russia and visiting Bosnia-Hercegovina and Croatia, where he delighted in firing heavy weaponry at “enemies” of Russia far from the frontier of the former Soviet Union. Such outliers, like their homologue Steve Bannon, pullulate in the former Communist world but, more significantly, in the countries dominated by Orthodox Christianity. 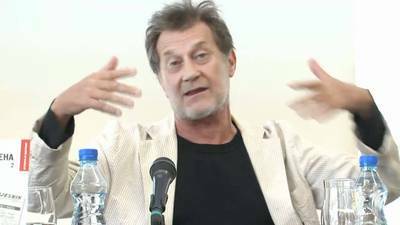 Greek mercenaries were active in the massacre of 8,000 Muslim men and boys at Srebrenica, as revealed by the outstanding Hellenic journalist Takis Michas. Greek Nazis with Serbian terrorist murderers in the Balkans. Financed by Russia. Beginning in 1912, Greek, Serb, Montenegrin, Romanian, and Bulgarian terrorists rampaged through the former Ottoman provinces in the Balkans, leaving a trail of fire and blood that elicited powerful condemnation from liberals and socialists in the West. Chroniclers of Orthodox genocide included the Carnegie Endowment for International Peace (created by Andrew Carnegie, the George Soros of his time) and Leon Trotsky, then a journalist based in Vienna. Trotsky lambasted the Russian “liberals” who backed genocide, lashing the democrat Pavel Milyukov for his complicity in the murder of Albanian infants. But this pattern holds through recent history. Romanian Orthodox terrorists were also seen at Srebrenica. 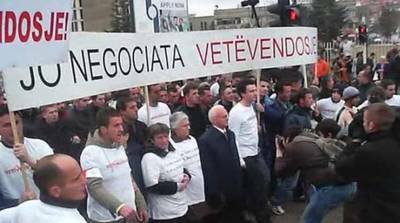 In 2007, Romanians assigned to United Nations police duties in Kosova murdered two Kosovar Albanian political activists, Mon Balaj and Arben Xheladini. In memoriam Mon and Arben. 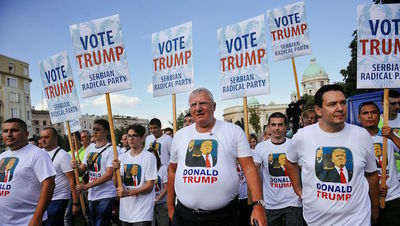 Kosovar patriots oppose current intrigues, supported by Trump, for partition of their republic. 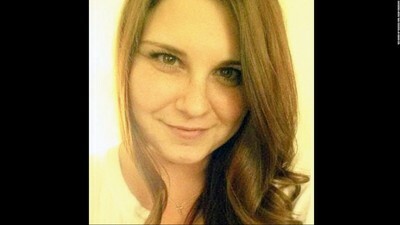 Most recently, a distasteful figure named Matthew Heimbach, an accomplice in the Charlottesville riot that killed Heather Heyer, an antifascist activist, has capered publicly with an Orthodox cross around his neck and other Romanian fascist symbology. As I observed in my reporting from the Balkans, Romania harbors the largest and most extreme neo-Nazi subculture in eastern Europe, second only to Russia and ahead of Hungary under Orban and Serbia, the terrorist black hole. Fatty Slimebach. How not to be an American. Recommended for permanent resettlement in Antarctica. Heather, immortal sister comrade. We pledge never to forget you. We will never cease fighting with your image in our hearts. We will never give up. 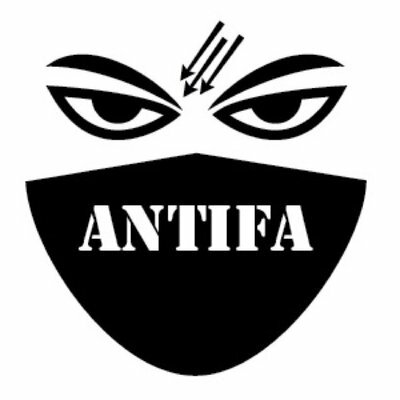 Permanent death to fascism! 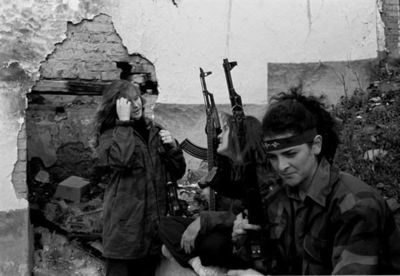 No hero of our time can exceed the Bosnian women who took up arms in defense of their dignity, and that of their nation and republic. They are our mothers, in every sense. All of our being is dedicated to them and to their example. 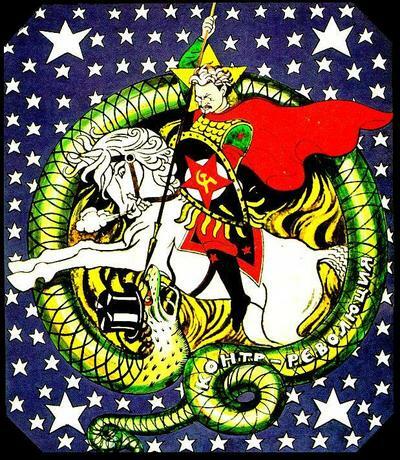 I have been derided for comparing the current breakup of American comity with the collapse of ex-Yugoslavia, but have insisted on pointing out, perhaps too stridently, the persistence of the post-Soviet pattern. First comes disinformation (“fake news”). Then deliberate ethnic polarization. Followed by the appearance of militias and other violent fascist entities. All with Russian financing. The West was warned, but ignored the warnings. We must all now live with the result.